Folk dress in Western Europe refers to the clothing of rural populations engaged in farming, fishing, or herding. Variously termed peasant, rural, or regional dress, it may also be considered ethnic dress in regions with more than one ethnic group. In all cases, folk dress identified people with a place. From the fourteenth to the eighteenth centuries, the dress of rural dwellers reflected the fashionable styles worn by those from the middle and upper ranks of society, albeit in simplified form. In many parts of Europe, sumptuary laws limited decoration and restricted use of materials so that peasants would easily be distinguished from those of higher social standing. The elimination of sumptuary laws, combined with land reforms, brought about a true flowering of folk dress in some, but not all, Western European countries in the late eighteenth and early nineteenth centuries. Around the same time, political changes in Europe spawned nationalist movements in many countries. Early ethnologists began systematically collecting songs, legends, myths, and examples of regional dress to bolster the argument for the existence of a national character in the "folk." The romanticism of the era contributed to the invention of traditions not based in historical fact. 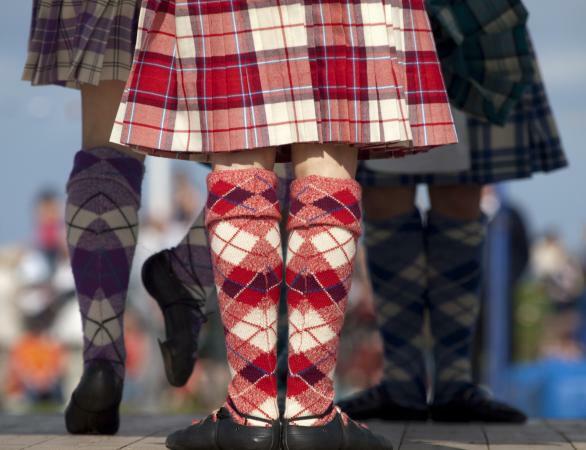 The concept of invented traditions fits easily with the socalled folk dress of Scotland, Wales, and Ireland. Scotland is known for the man's kilt made from clan tartans. Historically, the Celts in Ireland and Scotland wore shirts and plaid mantles, which they arranged on their bodies in various ways. Sometime after 1727, Thomas Rawlinson, an Englishman living in Scotland, separated the plaid into the pleated kilt, or philabeg, and shoulder wrap. It became so popular that the English banned it after the rebellion of 1745, which served to strengthen its association with Scottish culture. After 1780, the mythology surrounding the kilt expanded to include the assignment of certain "setts," or plaid patterns, to specific clans. Wales and Ireland offer more recent examples of invented traditions. As Welsh language and culture faded in the early nineteenth century, intellectuals promoted the preservation of customs and traditions. This extended to dress. In 1843, Lady Llanover invented a Welsh "national" dress loosely based on rural clothing of the 1780s: short gown, petticoat, and cloak of checked or striped wool worn with a tall beaver hat. In actuality, no one had ever worn that type of hat. A similar situation occurred in Ireland in the late nineteenth century when cultural leaders proposed a tunic and mantle combination inspired by the "ancient" dress of brat and léine. It became more Irish by adding Celtic embroideries. England did not suffer the same crisis of identity as did Scotland, Wales, and Ireland; thus it did not have a folk dress. Certain occupational dress styles, such as the farmer's smock, were worn over breeches or trousers in rural areas. The Scandinavian countries of Norway, Sweden, and Finland have strongly developed folk-dress traditions encouraged by the Romantic revival. Denmark's folk dress is not so well known, because the Danes did not systematically collect folk material in the nineteenth century as did the Swedes and Norwegians. Today, all of the Scandinavian countries actively preserve their folk dress. In America, descendants of Swedish and Norwegian Émigrés don folk dress for festive attire. In Sweden, each local parish has its own costume, which is still worn as festival dress. The authors of Folk Costumes of Sweden: A Living Tradition identified over 400 local costumes in use in the 1970s. While the parish costumes of some provinces such as Skåne, Dalarna, and Hälsingland have a long history, others are "reconstructed" based on old costume material in museums. Local costumes are seen as an expression of identification with one's home community. Some of the jackets have features dating to c. 1600, such as shoulder wings and pickadils. Norway was under Swedish rule until 1905. The country's mountains and fjords promoted the development of independent communities organized around church parishes, each of which had distinctive sartorial customs. Sunday and festival dress was decorative while everyday clothing was quite plain. During the nationalist movement of the late nineteenth century, the folk dress of the Hardanger region came to symbolize Norway. It consisted of a long skirt, embroidered vest, and cut-work linen blouse in the heraldic colors of black, red, and white. Hardanger brides wore elaborate crowns, which they exchanged for marital caps during the wedding ceremony. Around 1900, the bunad movement promoted the wearing of other regional costumes for folk festivals, thereby expanding the Norwegian folk-dress repertoire. Lapland, an area north of the Arctic Circle, is an ethnic area rather than a political entity. Its people, known as the Saami, are reindeer herders who roam across northern Norway, Sweden, and Finland into Russia. Not surprisingly, their clothing is made from reindeer skins and the fur of the Arctic hare. The colorful dress of the Saami, still worn for festive occasions, consists of a wool tunic worn over trousers and ear-protecting caps. Curled boots made from reindeer hide and stuffed with straw keep feet warm during the cold winters. The dominant colors are rich blue accented with red. Braids, tassels, and pom-poms in red, green, and yellow further enliven this unique costume. Common to all Scandinavian countries is the wearing of silver brooches and pins, believed to ward off evil. The shiny metal protected people of all ages from legendary supernatural forces such as trolls and gnomes. The Netherlands, France, Germany, Austria, and Switzerland have well-developed folk dress traditions. In the Netherlands, rural clothing from various districts is preserved in museums. Simplified versions are worn at events commemorating Holland's association with the sea, as well as in tourist areas such as Volendam and Marken. A typical man's outfit consists of blue woolen trousers and jacket worn with a flat cap and wooden shoes. Winged white caps are characteristic of women's dress. In France, the proximity of peasants to fashionable Paris stunted development of a folk dress with the exception of a few distinctive customs in distant regions based on long-defunct historical styles. In Brittany, women continued to wear stiffened high lace caps with lappets hanging down the back into the nineteenth century. In the Savoie region bordering Italy and Switzerland, women wore white fluted headdresses and ruffled collars. The women of Provence sported quilted petticoats made from beautiful hand-printed cottons manufactured in the region. In Germany, Austria, and Switzerland, the folk dress of certain districts is better known than others, thanks to the Romantic movement. German societies formed in the 1880s revived the costumes of the Black Forest and Upper Bavaria. Bavarian costume is still worn today at Munich's Oktoberfest. Austrian folk dress, known as tracht, is often synonymous with Tyrolean costume, even though Austria is divided into eight costume districts. 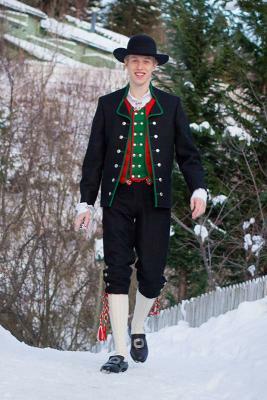 The Tyrolean costume has influenced fashionable dress at various times. In Switzerland, the National Federation of Swiss Costumes was founded in 1926 to preserve regional dress. Swiss folk dress is categorized by canton (geographical division). In the fifth edition of Ardern Holt's Fancy Dresses Described; or, What to Wear to Fancy Balls (1887) the most characteristic Swiss dress was that of Berne. Holt recognized that Swiss costumes varied by canton, but dismissed some of them as "not picturesque" (p. 215). In all three of these countries, women's costumes featured dirndl skirts, fitted vests, white blouses, and distinctive caps, while men's displayed colorful vests and coats worn with knee breeches or leather hose. The latter are known as lederhosen-short leather trousers with suspenders-and are worn in both Germany and Austria. A fulled woolen fabric known as loden was used for men's clothing in Austria. Woolen embroideries of hearts and flowers are common to both men's and women's folk dress in these areas. One of the most distinctive ensembles of the Mediterranean area is the Andalusian dress of Spain. Situated in the southernmost region, Andalusia absorbed Moorish influence. In the eighteenth century, women began wearing maja (female dandy) and gitano (gypsy) costumes inspired by the region's machismo culture that glorified bullfighting. The maja look incorporated jackets and skirts trimmed with black lace or fringe, mantillas, and hair combs. 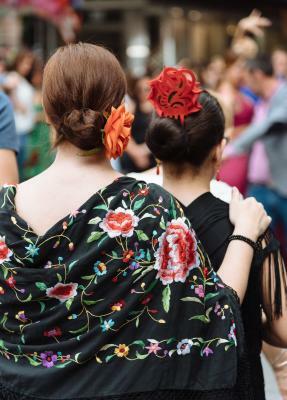 The gitana outfit included ruffled skirts and Manila shawls with colorful embroidery. Men wore tight-fitting jackets and trousers, frilly shirts, and wide-brimmed hats. These popular outfits spread to Madrid and then to the rest of Spain. Eventually Andalusian dress came to represent Spain itself. Neither Portugal nor Italy has a well-known folk-dress tradition, although regional styles existed in rural communities in both countries. Portuguese folk dress is characterized by fine embroidery on linen garments. Folk dress on the European mainland typically reflected fashionable dress from various historical periods. Specific features may be traced to medieval, Renaissance, baroque, rococo, neoclassic, or Victorian sources. A basic woman's outfit consisted of a white shift, tight-fitting vest or sleeved jacket, full skirt, apron, shawl, and head-gear. Headgear was often the most distinctive part of the costume because it signified marital status; unmarried women wore wreaths or crowns, while married women covered their hair with caps or draped cloths. A typical male folk costume included a simple shirt, a pair of breeches or trousers, a vest or jacket, leather boots or shoes, and a hat. Folk dress varied locally, particularly that of women, depending on availability of raw materials and knowledge of specialized techniques of manufacture peculiar to a region. Most people in a particular district dressed alike because conformity was prized over individuality. Clothing signified membership in a community. Home production of cloth was integral to folk dress. Both sexes were involved in flax and wool production. Women knew how to spin, weave, knit, and embellish the cloth peculiar to their region. They learned embroidery from pattern books featuring curvilinear patterns such as hearts and flowers. Occasionally special materials (silk ribbons and fabrics) were purchased to trim garments. Some regions specialized in particular textile techniques, for example lace making or tablet weaving. Local tailors sewed garments of more complicated cut, that included vests, jackets, and coats, and hard-to-handle materials like leather and fur. Women sewed the garments cut from rectilinear pieces of cloth, such as shirts, shifts, skirts, and aprons. Bast fibers such as flax and hemp grew easily in the moist cool climates of northern Europe; thus, they became the fibers of choice for shirts and cloths for the head and neck. Woolens in medium to dark colors were made into skirts, trousers, breeches, vests, jackets, and coats. In a few regions, leather was used for breeches or trousers. Shoes were of leather, too, although sometimes other available materials like bark or wood substituted for leather. Silk fabrics were a luxury, appearing only in accessories and trimmings. The industrial revolution made commercially produced fabrics and clothing widely available for moderate prices, gradually replacing hand-woven fabrics and ultimately the homemade clothing itself. In most areas of Western Europe, people stopped wearing distinctive rural styles by 1850. In the early twenty-first century, some Europeans and European Americans wear folk dress to festivals and celebrations as "costume" to signify their affiliation with a particular country or region. The making of accurate reproductions is of great interest to these people. Greek folk dress has more in common with the Balkan countries than with western Europe. Over the course of its long history, Greece has absorbed influence from Byzantine, Italian, and Turkish culture, resulting in great diversity in the form and decoration of its folk dress. After the Revolution of 1821, islanders and city dwellers abandoned traditional dress in favor of fashionable dress. Like their European compatriots, in the 1840s the bourgoisie developed a national folk costume consisting of the skirted foustanella for men and a fitted jacket, skirt, and fez cap for women. These outfits remain popular to this day as a symbol of Greece and are worn by Greek school-children in Greece and abroad for national celebrations. In the more geographically isolated farming and herding communities, the wearing of regional folk dress continued until the onset of World War II. See also Eastern Europe Folk Dress; Folklore Look; Roma and Gypsy; Scottish Dress; Spanish Dress. Arnö-Berg, Inga, and Gunnel Hazelius-Berg. Folk Costumes of Sweden. Translated by W. E. Ottercrans. Västerås, Sweden: ICA bokförlag, 1975. Dunlevy, Mairead. Dress in Ireland. London: B. T. Batsford, Ltd., 1989. Fochler, Rudolf. Trachten in Österreich [Costumes in Austria]. Wels-München, Germany: Verlag Welsermühl, 1980. Kennett, Frances. Ethnic Dress. New York: Facts on File, 1995. Nelson, Marion, ed. Norwegian Folk Art: The Migration of a Tradition. New York: Abbeville Press, 1995. O'Kelly, Hilary. "Reconstructing Irishness: Dress in the Celtic Revival, 1880-1920." In Chic Thrills: A Fashion Reader. Edited by Juliet Ash and Elizabeth Wilson. London: Pandora Press, 1992. Sichel, Marion. Scandinavia. London: B. T. Batsford, Ltd., 1987. Snowden, James. Folk Dress of Europe. London and New York: Mayflower Books, 1979. Stevens, Christine. "Welsh Peasant Dress-Workwear or National Costume?" Textile History 33(1) (2002): 63-78. Trevor-Roper, Hugh. "The Invention of Tradition: The Highland Tradition in Scotland." In The Invention of Tradition. Edited by Eric Hobsbawm and T. Ranger. Cambridge, U.K.: Cambridge University Press, 1982. Welters, Linda, ed. Folk Dress in Europe and Anatolia: Beliefs About Protection and Fertility. Oxford and New York: Berg, 1999. Worth, Susannah, and Lucy R. Sibley. "Maja Dress and the Andalusian Image of Spain." Clothing and Textile Research Journal 12(4) (1994): 51-60.